Most of the time, the vendors occupying any particular stretch of sidewalk are fairly consistent. The shoe repairman is next to the roti sai mai vendor, who is next to the steamed corn and peanuts vendor, who is next to the magazine vendor. 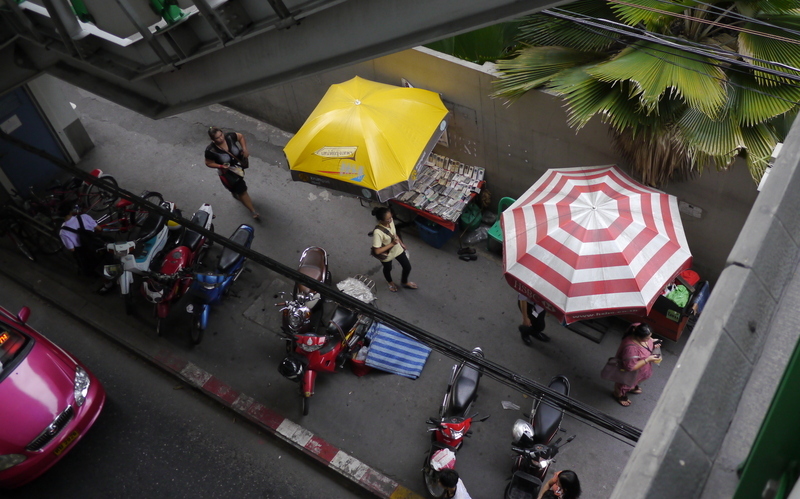 But the other day, I looked to the street below the Thong Lor Skytrain station, and saw a vendor whom I had never seen before. For a few moments I stared, trying to figure out what, exactly, the vendor was selling. Finally, I descended to the street for a closer look. Sure enough, he had a table full of remote controls: remotes for air conditioner units were in the back and remotes for various other electrical appliances were in the front. There must have been a few hundred different models. This struck me as odd, because demand for remote controls must not be very high. It also struck me as odd because, since I had never seen this vendor here before (or since, for that matter), how would people know where to seek him out? Doesn’t seem likely, does it? This entry was posted in Uncategorized and tagged Bangkok, control, Remote, street, Thailand, vendor by christao408. Bookmark the permalink. Well, I would have almost had need for a replacement remote for the a/c unit. Good to know there is a seller in BKK. The answer to all his customers needs . A remote control vendor? That definitely takes the cake. It reminds me of a Wizard of Id comic from long ago.King to Peasant: What are you growing, farmer?Peasant: Lillies.King: That’s useless!Peasant: They should go like hotcakes during the famine.I wonder what shortage this fellow is counting on? So that’s where my remote control is. Pls let me know if you find a table that sells single socks. I’m sure the socks I lose in my washing machine will be there. I’m puzzled. How do you get the remote to work on just your appliances and not mess with the neighbor’s? Or maybe that is the point of getting several different ones? hehe! Used to be that IR remote controls could be found for programing a universal remote control. Some IR signals are so unknown that you need to buy a remote control for a certain particular unit.My Palm device used to be able to buy a program that can copy the IR signal. Some geeks are able to remote control just about any device. one birthday my hubby got me a remote control for the t.v. cause I complaiined that ours stayed next to him all the time. I thought it was really sweet of him. How will the remotes work, say on a tv in your home or your kitchen gadgets. Don’t you have to program them? Gosh. How do you find all this stuff? Is it just Bangkok? @ahmd1430 – Please stop proselytizing on my blog. It is unwelcome spam. people would try to sell anything for the sake of earning an income. i see that too often here in jakarta. but they always managed to get me confused as the items they sell often times are NOT the everyday stuff you’ll need and they ALL used. and so i always wonder how they’ll able to make any sale at all? @Inciteful – That’s a good question. I think it is just Bangkok, because I don’t spend a lot of my time out looking for these things. For the most point, I just try to keep my eyes open and my camera at hand when I am out. @rudyhou – Yes, I wonder the same thing. 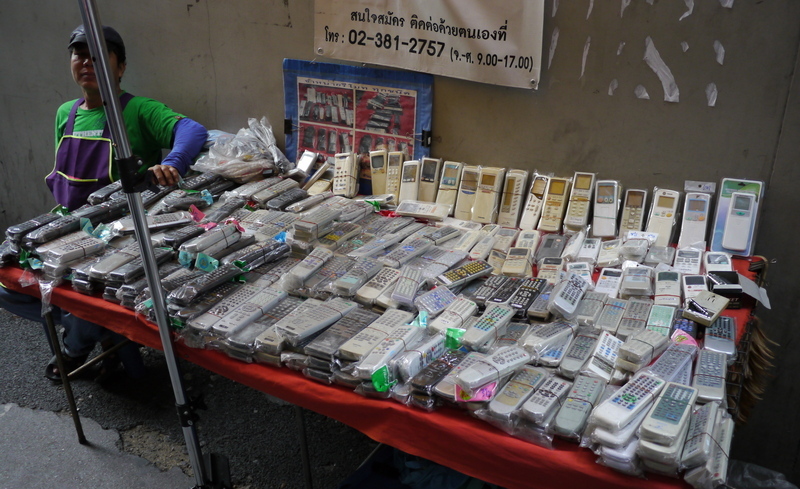 How many remotes, for example, is someone going to actually sell in a day. Perhaps I should ask. @Grannys_Place – Maybe if they need some supplies, I can connect them to my local remote vendor! LOL@ZSA_MD – @murisopsis – That’s too technical a question for me! =D@jillcarmel – His and Hers remote controls? @PPhilip – Don’t some manufacturers use a tablet-like device now as a universal remote? @ElusiveWords – Random lost sock vendor? Will have to keep my eye out for him. @CurryPuffy – Well that is the obvious next question, isn’t it? Where did he get the remotes and where are the devices that they went with? @n_e_i_l – Great line from the comic! Who knows what customer base he expects to tap into? Maybe there will be some crisis that requires us to purchase old remote controls. @Fatcat723 – But who is buying them? That’s what I don’t understand. @beowulf222 – If you need me to search for any particular remote, just let me know. @CurryPuffy – Yeah, I wonder the same. LOL@PPhilip – OK, THAT just got me a totally wrong, mean, bad idea how to annoy the neighbors. *haha* @christao408 – I am certain that when I really need a remote control, the vendor will be untraceable. @ZSA_MD – There are certain universal remotes with a booklet that will tell you what code to use for a particular brand of television.For instance Logitech’s Harmony 300 remote can control up to 4 devices when programmed right. ( about $30) When you pay more you can get larger devices (if you are hard to read small print) and reduce the number of remotes needed to change all the devices.